Maplewood Police posted on social media on Monday that a man police stopped for “acting suspiciously” in a residential area had a gun. Updated with further information: Cpl. Dan Fernandez saw the subject at 3:30 a.m. while on routine patrol near Sutton Boulevard and Richmond Place. When the subject saw the police car he hid behind a tree. Cpl. Fernandez radioed for support and conducted an investigation resulting in the arrest. 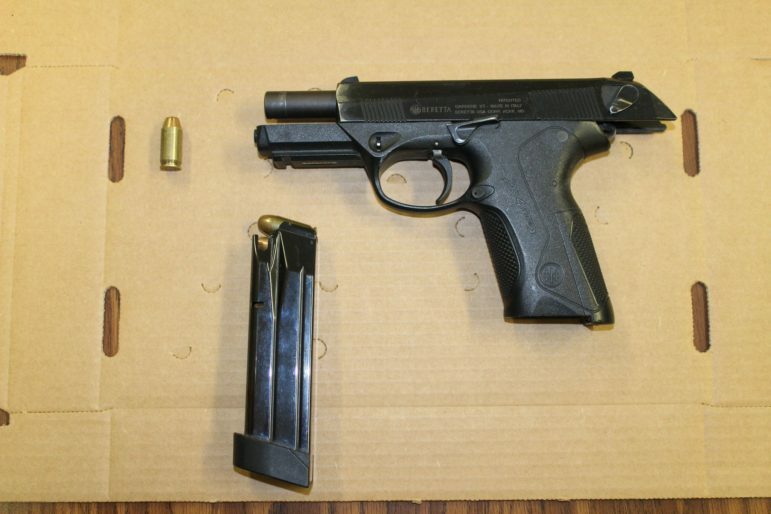 The handgun had been stolen from a resident’s car. Thank you, MPD, and Cpl. Fernandez! Well done….you are appreciated! Well imagine that; profiling works. If the City off St. Louis would profile, stop & frisk, pull over the thousands of cars driving around with expired plates, fake dealer temp tags or no plates at all the gun crimes would drop instantly because these types are like the suspicious guy walking around in a subdivision. Sticking out like a sore thumb looking for a victim. Thats right, I said it. Remember folks, don’t leave anything of the slightest value visible inside your car. Not even loose change (much less a handgun). Summer is near, this kind of stuff is going to be happening more. I like how Maplewood police drive around with their lights on looking for people it’s just another way of keeping us safe so good job Maplewood Police Department keep up the good work!!!!!!! Props to the MWP police for doing a fine job taking this thug off the streets. Some facts missing. He was from north St. Louis county. How did he get here? did he have a car? what did he say he was doing, purpose of visit? explanation for carrying .45 cal weapon? More detailed description – height/weight/race? Likely came down on MetroLink to carjack, home invade, steal, etc…. Probably more of this type of stuff happening in our town than we ever hear about. It makes me sad but it is a fact of life. I am glad we have officers who are trained and alert about who should be in the neighborhood and help keep us safe. I am not sure of it but I am guessing some alert homeowner probably called about this suspicious person and got the police involved. We all need to do our part if we want to help keep Maplewood safe and report things, support our officers, get to know our neighbors, their cars, their pets, etc. This is a time of year when folks are getting outside work done on their homes, there are multiple road crews around town we have lots of folks we are not used to seeing. But a little checking things out may be needed by all of us to help keep Maplewood safe. Great job for getting that guy off the streets and keeping Maplewood citizens safe.